A Mid-Summer's Day Along Pennsylvania's Historic Route 6. If I had to guess, I'd say Pennsylvania isn't very high on most travelers' lists of "must-see destinations." Pittsburgh and Philadelphia bookend 46,055 square miles of farmland, state forests and Amish country - none of which anyone's told me they're dying to see. Having went to school in central Pa., I understand that. Trust me, it's not the most glamorous place for a twenty-something year old to spend his or her time. Pennsylvania is, however, a gem of Americana. From auto shows and Victorian homes to classic drive-in theaters, this state promises no views of grandeur and forces you to appreciate the little things. If you look hard enough, you'll find the beauty it has to offer. Last summer I found myself on a rare mission: I had to drive from northeast Pa. to Buffalo, NY. I've traversed most of Pennsylvania but had yet to witness its northern half. I had done some reading on Route 6, which meanders east to west near state's northern border. The opportunity for a new adventure was prime. The nice thing about Route 6 is that it can be accomplished in a day or stretched out over many, depending on what you have time for. I was unprepared to camp out in a state park somewhere, so I made a day trip out of it. The first third of Route 6 (heading west) runs alongside the Susquehanna River, which squiggles its way from Cooperstown, NY to the Chesapeake Bay. An important artery for transportation dating back to Colonial times, the Susquehanna is spotted with numerous historic towns. When I stopped to take in the view of the river, I imagined what it might be like having a life there. The Endless Mountains; that's what they're called in northeast Pennsylvania. The landscape is nothing but rolling, sprawling hills that ramble on as far as the eye can see. While I appreciate this landscape nowadays, it used to leave me unamused. Growing up at the foot of a 3000' mountain spoiled me in that regard. This stone gazebo made for the perfect lookout point to view the landscape. It was almost as pleasant to look at as it was to look out of. Once passed Towanda, the Susquehanna breaks off from the road; turning north toward its source in central New York. 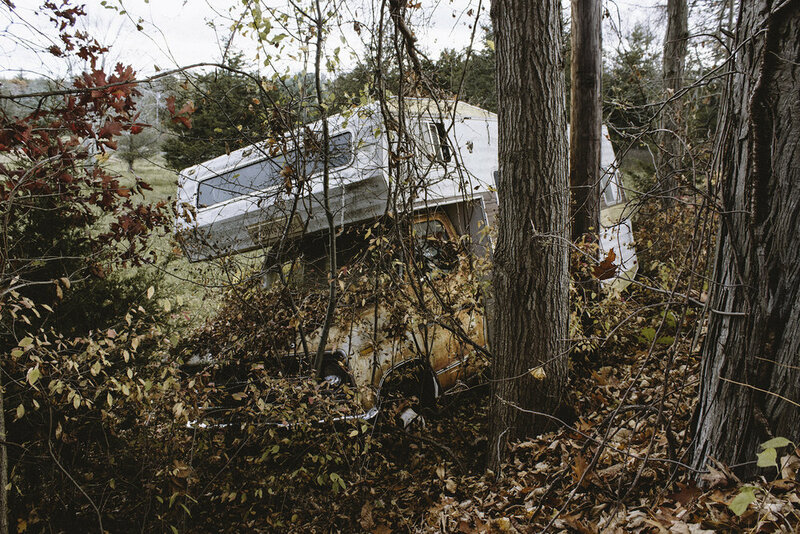 From there, Route 6 ventures into a section of the state known as the Pennsylvania Wilds. If you're ready to experience the gritty details of northern Appalachia, this is where the journey really begins. Of all the roadside attractions scattered along the route, the Pennsylvania Lumber Museum stood out to me the most. Located in the dead center of Route 6, It was actually closed when I showed up, but I was able to catch a glimpse of an old structure belonging to this unique exhibit. On long solo drives like this, it's always important to get out and stretch (just to keep the blood flowing.) Route 6 happens to have its own little rest area somewhere in the middle. While I'm sure you'll get out of the car plenty if you do this trip yourself, it's always nice to see state-funded services to bolster its attractions. Thank you PennDOT for this convenient little respite. While I find I stop often to stretch my legs and see some sights, there weren't all that many roadside turnouts to take in views along Route 6. When I stumbled upon one, I made sure to take full advantage of it. However, as I've come to learn on road trips, the best views usually don't offer pullouts; you have to find them yourself. Every remote destination has it's unique housing options. I immediately pulled over when I spotted this quaint lakeside cabin. I mentioned earlier the abundance of historic Victorian homes across the state. I wont leave you hanging without this shot of a spooky one in Coudersport. Addams Family-esque. Nowadays you see a lot of people planning huge trips to places like Iceland, Thailand and countless other global destinations. Don't get me wrong, those places are awesome - I had the pleasure of studying abroad myself. But when I returned home with a taste of the world in my mouth, I realized I needed to explore more of my own country - my own backyard - before I ventured further into the great beyond. It's an endless pursuit, and one that isn't glamorous either. America is huge, and exploring its nooks and crannies has been both eye-opening and fulfilling. It's the little trips like this one that have changed my definition of "travel" and inspired me to continue digging for the diamonds in the rough, like Pennsylvania's Route 6. To plan your own trip to Route 6, visit their website http://www.paroute6.com/. I did this trip spur-of-the-moment, so I missed out on a lot of the attractions along the way but looking at the site is making me want to go back and do it all over again. If you want to see the full set of photos from this trip, check out "pa route 6" under the collections tab. As a kid growing up in Catskill State Park, I was fortunate to experience four vastly different seasons each year. Winters were harsh, spring was fresh and stormy and summers were hot and humid. However, none of them compared to the colors and scents that emerged in fall. When the first leaves start to turn each year, I'm always overcome with a wave of nostalgia that takes me back to being six years old again; playing in leaf piles, walks in the woods and pumpkin picking. I'm convinced that there's no better fall foliage on earth than in the Hudson Valley. I've missed it only once in my life and to be honest I was devastated about it. When you spend all those years molding your lifestyle around the seasonal cycles, disrupting that pattern is more offsetting than one might imagine. So I made a concerted effort to spend the entirety of fall back home this past year. I went out on many day-ventures while being home. Usually, I waited for a cloudy day. The best days in fall are the cloudy ones; where the light is nice and soft. The colors of the leaves pop a bit more and it accentuates the comforting spookiness of the crooked northeastern woods. While traveling the backroads, it always surprises me how differently I see things with the purpose of shooting in mind. This little house with the red roof? I must have driven past it thousands of times in my life but never truly noticed it was there. I first caught a glimpse of it sometime in late September when the trees behind it were still mostly green. I made sure to return when autumn was in full swing. It's nice having fresh eyes on a landscape that seems commonplace most days. One thing that photographs can't convey is the aroma of the leaves that pad the earth this time of year. The crunch of them under your feet is immeasurably satisfying and each step releases more of that sweet fall scent up into the air like a perfume. Combined with the crisp frosty smell of early October mornings, it's unbeatable. The area is spotted with abandoned barns that are home only to bats and memories these days. To some they might come off as haunting but to me it's a sight I've grown up with. I'm not sure what many of them were used for; hay, tools and other barn things is my best guess. Regardless, they're a signature sight that give this place it's charm. To me they say "home" as much as anything. With abandoned barns comes abandoned cars and machinery as well. 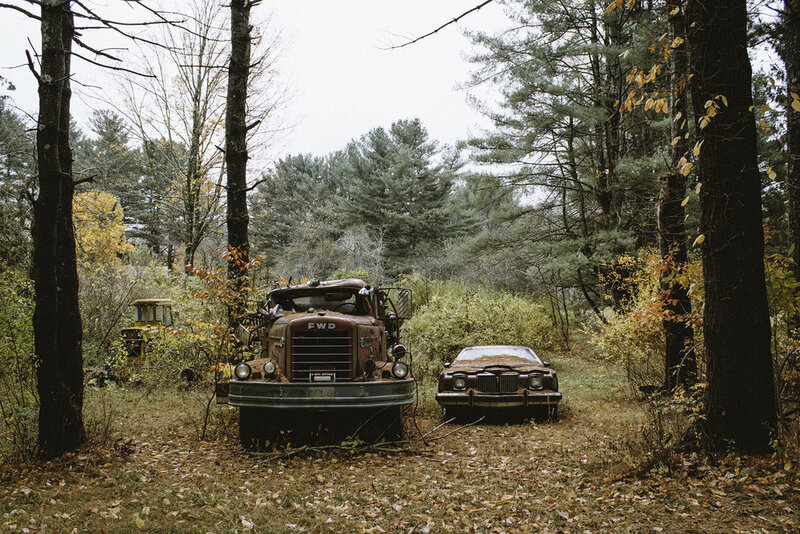 Folks part their old station wagons in the woods and they sit there for 10, 20, 30 years on end; rusting out and eventually becoming known as landmarks to locals or passerby's. The deep red and brown rusty colors blend well with the peak of fall season. 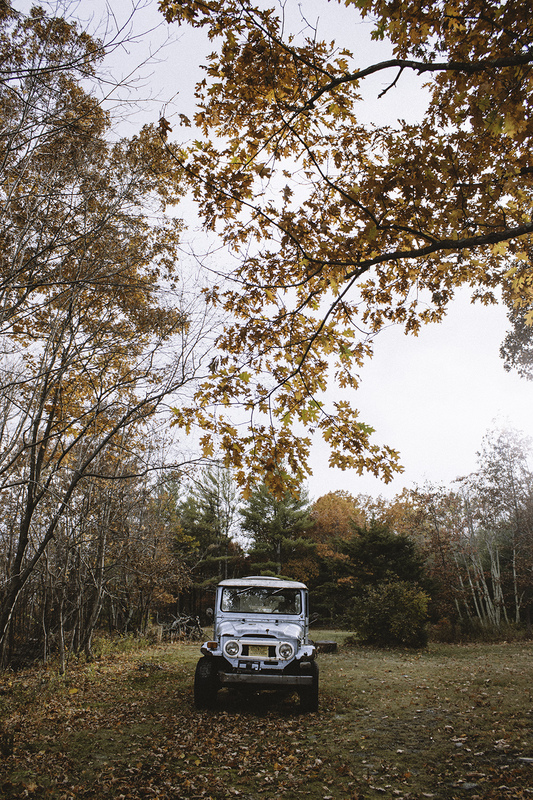 Fall days in the Catskills are to be enjoyed to the fullest, especially as the days become shorter. Despite it's equivalence in length to the other three divisions of the calendar year, autumn is fleeting. The sights and sensations simply do not last as long as those of other seasons. So if you're ever looking to chase some foliage, take a trip to the Catskills next fall. You'll be glad you did. As I pulled off the final stretches of pavement on the Shenandoah Skyline Drive, I knew that I still had 469 miles of Appalachian wilderness ahead of me; more commonly known as the Blue Ridge Parkway. Shenandoah conveniently connects to the Parkway, so passing by the entrance sign almost felt like a "chapter two" of sorts, as far as the road trip was concerned. There was a late-summer fog that seemed to swallow the entire south. The late-August humidity was almost unbearable at times but it certainly made for some interesting photo ops. Occasionally I would wind to the crest of a ridge and the clouds would part for just a few moments, allowing a glimpse of the sprawling farmlands in the valley below. With fog came rain - not a downpour, but a steady, deliberate mist that hugged every hair follicle on my body and kept the landscape damp and dreary. While it wasn't the best for camping, it kept my imagination at work as I slowly rounded each corner of America's favorite drive. Technically a national park, the BRP is truly worth seeing from start to finish. There are more outlets along it than Shenandoah but still only two ways to go; North and South. The speed limit is a bit higher than Shenandoah - 45 MPH - still just slow enough to allow you to absorb your surroundings as the road pulls you further into the clutches of the South. Being under the umbrella of the NPS has its perks. Campsites are speckled along the way, which truly allows you to slow down and enjoy the full experience instead of rushing through it in a day. The first campsite I stayed at was Peaks of Otter, just under 90 miles into the journey. The whole thing is situated on a hill and slopes down toward the road. I had some very friendly neighbors that evening. They invited me next door to their campsite for beer, chili and hot dogs. As you ride along the Parkway, you get a deep sense of the region's history - loggers, rail workers and pioneers all left their mark in some way. Ruins still exist here and there but there's plenty of signs that tell the story of the land. One thing I loved about the Parkway was its charm. Every person you saw on the road - whether in a car, a motorcycle, a bike or on foot; young, old or somewhere in-between - was there as a traveler. People come to experience the journey. I could feel that sense of understanding between each soul that passed by. It was almost like a "tip of the cap" each time. 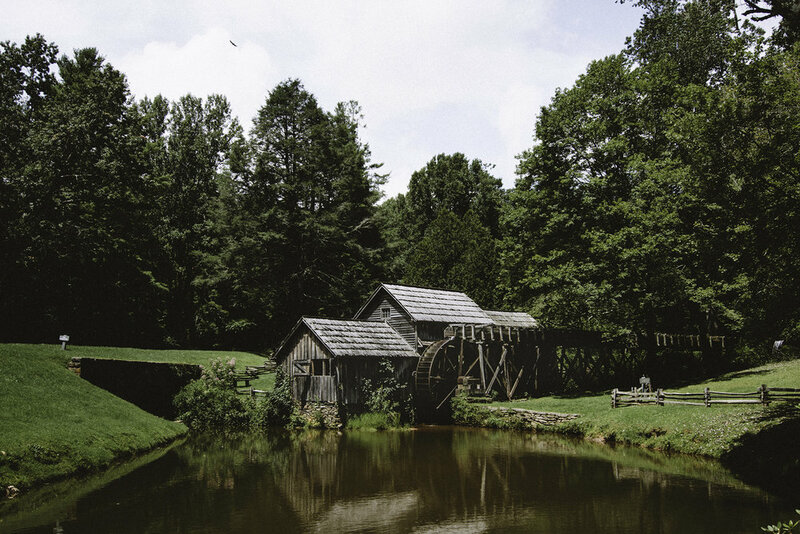 One of the most pleasant stops along the way was the Mabry Mill. Sure, it was one of the more "touristy" places along the Parkway; but the journey is so long and stretched out that it didn't feel like such with visitors dispersed along nearly 500 miles of road. The Mill is picturesque; truthfully right out of a storybook. It's nestled on a pond and is surrounded by thick woods. The mill grounds also boast a blacksmith shop, a lovely little diner and an old time whiskey still. If there was ever an image to depict southern Virginia, I imagine this would be it. Where Virginia ends and North Carolina begins was a mystery to me. The backwoods blend together and at some point during a sleepy stretch of road you realize that the road signs are shaped differently and that you must've crossed into N.C. without knowing. A gentle introduction, indeed. The elevation was high enough in some places that the pullouts sat above the fog. Roadside foot trails offered awe-inspiring views that I couldn't have dreamt up. The BRP is also not just a national park; plenty of folks live alongside it. Endless farmlands paint the rolling hills as you wind deeper and deeper into the countryside. I remember thinking to myself it must be cool writing a letter to someone that lives down here, addressing it "Blue Ridge Parkway" on the envelope. Quite possibly the most famous image of the Parkway is the Linn Cove Viaduct. It was one I would not be able to witness due to the fog. Perhaps someday. A later overnight stop on the journey was at Mt. Pisgah, over 400 miles in toward the south end of the Parkway. Again, fog shroud the place and I wasn't able to absorb any of the views. However, I was able to capture some roadside images during late afternoon as the sun poked through the trees. It would be the last time I'd see sunlight on the trip - a trip that was truly unforgettable. *The Outbound Collective was kind enough to ask me to write a story for their amazing website featuring outdoor adventurers and storytellers. This is the piece I wrote for them. As the Summer of '16 winded down, one thing from my to-do list had yet to be fulfilled - a road trip. To where, though? I had been north to Canada; I had been west to the mountains. However, one segment of America I had not yet explored - the South. I have family down in Atlanta and with some free time on my hands, the perfect opportunity lay before me to take a road trip. 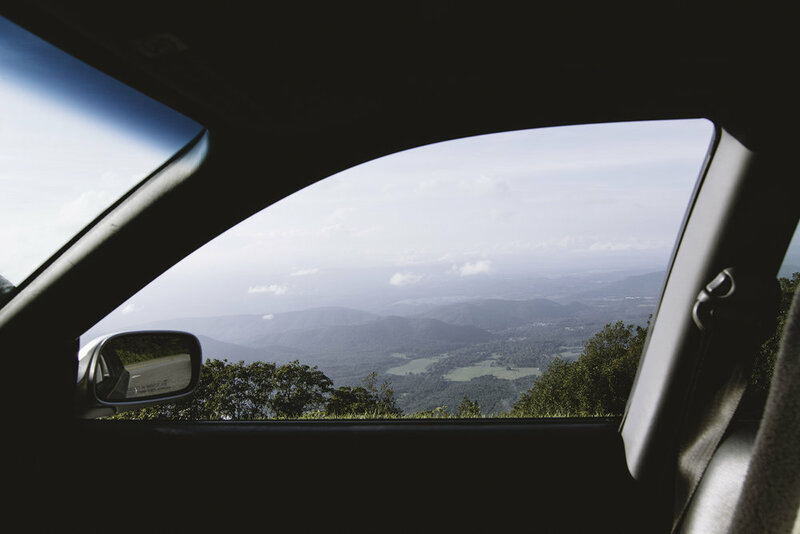 I devised a plan to spend about four days and three nights along one of America's most scenic byways - The Shenandoah Skyline drive and the Blue Ridge Parkway, which connect in central Virginia. The first day I spent driving about five hours to stay with a friend near Washington D.C., which was close enough to the real starting point of the journey that I could simply wake up the next morning and begin. At dawn, I hopped on I-66 West, which was a quick hour ride to Front Royal, VA - the gateway to Shenandoah National Park's north entrance. After receiving a tip from someone familiar with the area, I grabbed a juicy burger at local sensation, Spelunker's. Finally, I was ready to begin. The Skyline Drive is one of the most amazing roads one can experience. It gently winds back and forth through 105 miles of stunning Virginia wilderness with 75 pull-offs to take in the view (about 65 of which I stopped at.) The 35 MPH speed limit ensures that you're here to take it slow and be in the present. There's simply no rushing through such a beautiful place. I spent the first day riding along, taking in the pull-out views and photographing the curves and stretches of road. It was pleasantly quiet in the park so I took my time soaking in everything. While there are plenty of hikes and outdoor activities to do in Shenandoah, the Skyline Drive is more or less the park itself. Many national parks are reserved spaces of land that have plenty of loops for circling and exploring. Shenandoah is unique in that the park is linear - only a few state routes intersect the park with options to exit. Otherwise, you're entering on one end and you're coming out on the other end, which encourages one to see its entirety. I'm generally all for roughing it, but it was a particularly humid week and I desperately needed a shower after driving for so many hours. I made my way to Big Meadows campground, which is a beautiful campground and one of the few I've experienced that have a full range of facilities. The ranger at the registration booth gave me a short list of her favorite campsites at the Big Meadows loop and I took her up on the spacious, yet secluded, A103. The weather was expected to deteriorate in the coming days, so I wanted to take advantage of what might be the last clear night on my trip. I made my way over to the Lodge to watch a spectacular Virginia sunset and converse with the travelers staying overnight.